Plenty of blue Highlanders flags peppering that seas of yellow. 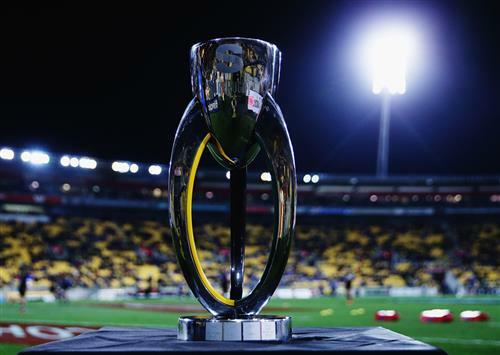 This will as good as atmosphere as Super Rugby has ever seen. We're underway as the Highlanders kick off down to Perenara who quickly kicks for touch. 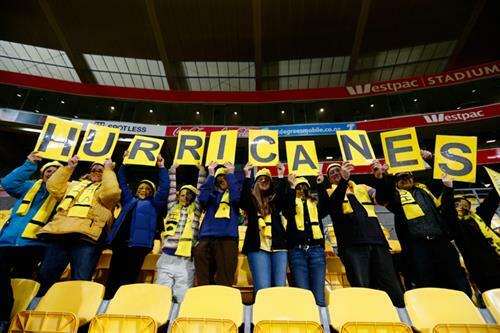 Highlanders win the lineout 30m out from the Hurricanes line and they set an early drive up the middle. Smith shovels the ball wide left but the Hurricanes defence is standing strong. Watching in a pub in Apia! Go my beloved 'Canes! 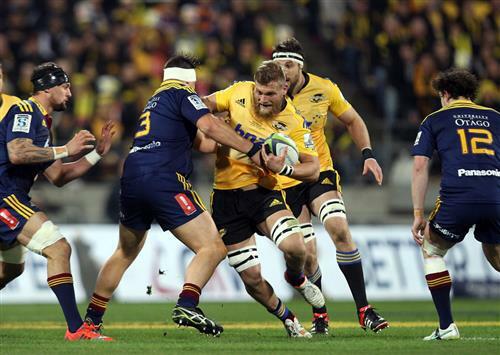 Ben Smith finally squeezes a kick down to Marshall and the Hurricanes clear easily. A quick hit of forceback breaks out with the Hurricanes back in possession near halfway. It's been a long opening sequence of possession. 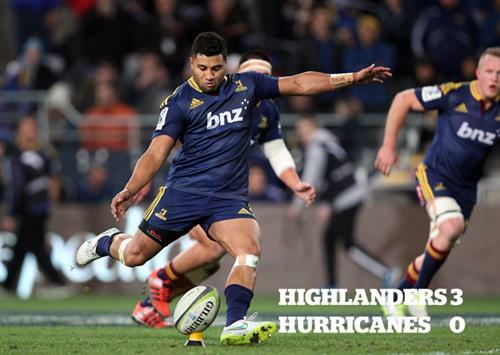 The Highlanders have now turned it over in a dangerous position and they swing the ball wide left to Osborne who is smothered in a tackle by four Hurricanes. Osborne is dragged into touch but the ref was playing advantage and the Highlanders will now have a chance to open the scoring with a shot at goal from 40m. highlanders look strong at the breakdown. Sopoaga slots the penalty and the Highlanders lead 3-0. Hurricanes win possession in midfield now and the Highlanders are offside. But the ref plays advantage. PENALTY HURRICANES - they weren't going anywhere so the ref blew for the penalty. Barrett will have a shot at goal now from about 40m out on an angle. Barrett has dragged his kick away to the left. Still 3-0 to the Highlanders. Perenara breaks a tackle from the restart but his pass is straight into the hands of a recovering Highlanders defender. 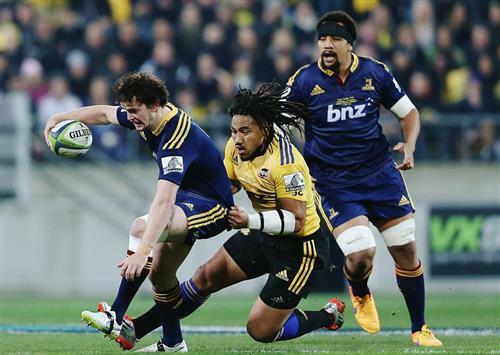 Highlanders are kicking often and early and hand the ball right back to the Hurricanes who try to break down the left. PENALTY TO THE HURRICANES - Nasi Manu judged to have left his feet. Barrett will kick for touch from inside his own half. Good attacking opportunity for the Hurricanes now as they win the lineout 40m out. Oh dear. Aaron Smith got himself into a spot of bother after winning possession as he got dragged back and threw a wayward pass. Eventually the Highlanders got trapped in-goal. Hurricanes scrum 5m out. Milner-Skudder hits the ball at pace off the back of the scrum. Hurricanes just metres away now. Penalty advantage to the Hurricanes, but they keep digging. They have the ball over the line but it's held up. The ref pulls it back for a penalty and the Hurricanes decide to pack another scrum. PENALTY AGAINST THE HURRICANES - the ref wasn't happy with the scrum and the Highlanders have survived. Sopoaga kicks for touch and the Highlanders move up to halfway. The game is being played at a cracking pace. It's end to end, wing to wing, full throttle stuff. The Hurricanes were attacking but now it's the Highlanders threatening out wide, and eventually Naholo is drawn into touch. Everyone pauses to catch a breath. The Highlanders are on attack again now, perched on the 22 and Aaron Smith is directing traffic. Ben Smith makes a great darting run toward the line and gets dragged down 1m short. But the ball is turned over. 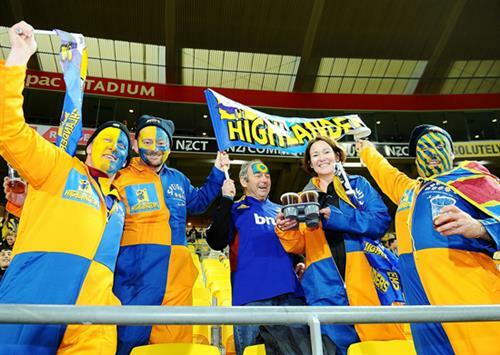 The Hurricanes have somehow managed to clear when the Highlanders looked to have a certain try. There have been precious few stoppages in this game. It's relentless. Highlanders are threatening again and Sopoaga attempts a drop kick. It's no good though, drifting just to the left. The Hurricanes are just hanging on at the moment. Barrett brings the ball up to halfway before Milner-Skudder kicks ahead. The Highlanders reply with a powerful boot into touch from Marshall. PENALTY AGAINST THE HIGHLANDERS - not releasing in the tackle. Hurricanes will kick for touch from just inside their own half. Hurricanes win the lineout and now have a penalty advantage. Penalty called. It will be interesting to see what the Hurricanes choose to do here. After a meeting of the minds Barrett is handed the ball and will kick for goal. But he's pushed his kick away to the right this time. The score remains 3-0 to the Highlanders.